Antisocial Behaviours. Are You A Lion Hunter? As a Dentist, you can’t go out getting drunk in your town and expect to keep a good business. Likewise, you can’t have deep dark antisocial habits or behaviours that your clients will turn their noses up to. Today, more than ever, there’s no back stage. What we do in private is never private. It’s the same for our employees. When they’re working for us, on our meter, we expect them to give us their best. But we also expect them to uphold our reputation and our standing in the community, by their actions and behaviours away from our office. We see it with sporting stars all the time. Off field misdemeanours that bring their club, the game and their sport into disrepute. Footballers with AVOs against them. What we do off the field impacts on how the we are perceived when performing our duties. Down here in Australia the Speaker of the House has now apologised for taking an expensive helicopter ride instead of a Parliamentary car to attend a fundraiser. And of course, there’s the British MP secretly filmed cheating on his wife and sniffing white powder. I’ve heard of someone with a suit and tie image being spotted on the weekend by a client out of place at a hardware store, greasy handed, looking for mower parts. The thing is that employment, and respect are earned. They are not a right. I recently heard of a Medical Practice where the two receptionists would stand outside the Front Entrance smoking and whining, in full view and earshot of visiting patients and clients. You’d have to believe that these receptionists see their employment as a right and not as a privilege? That would be the only way of explaining their behaviours. There are lessons of what NOT to do all around us just waiting for us to see them and take them. Do you have behaviours that are “pushing the envelope” and are incongruous with your standing in the community? And are you employing and tolerating staff behaviours that bring your business reputation down? Employment is a privilege, not a right. Oh and while you’re at it, lion hunting looks like a poor choice…. For more details about my Australian workshops in August, CLICK HERE. It’s already a #1 Amazon Best Seller! Is Your Dental Business Simply A House Of Cards? A very interesting newspaper article came across my desk last week. The article, “Why I sacked my dentist”, by Alexandra Cain, was published last Friday in the Sydney Morning Herald, and discusses why, after ten years, she has decided to change Dentists. As an authority in providing World Class Customer Service in the field of Dentistry, several colleagues, both dental and non-dental, sought my opinion on the article. What also made for fascinating reading were the online comments from the public about dentists, dental procedures, dental fees, and dentists’ incomes. So what went wrong for Alexandra, and how could her Dentist have prevented, or fixed the problem? Firstly, her dentist started calling her by the wrong name. Now this can be common. We become so engrossed in our procedures and the minutia and intricacies of what we are creating that our patient’s name simply pops straight out of our heads. I’ve always made it a rule that if you want me to pay you, then you need to know how to spell my name. And you need to know how to say it. And in this case, you need to know it. In this case, I’m totally perplexed how after ten years, Alexandra’s dentist starts calling her by the wrong name. I’d have left and changed dentists just for that! If you ever find that you’re forgetting your patients’ names while you’re busy constructing their dentistry, then the simple post it note can help. Simply have your Dental Assistant write the patient’s name in BIG letters on a post it note and have her stick it onto the bench beside your computer. As the chair goes back, you simply lift the post it note from the bench and stick it down gently on the corner of your patient’s bib, so it’s right there beside their mouth, in front of you, every time you need it! The second problem Alexandria’s Dentist had, was that no-one had been manning the phones when she phoned, meaning she needed to leave a message on a machine in order to enquire about an appointment. It seemed that the Dental Assistant was also doubling as the receptionist. In this day and age, I wonder how many callers even bothered to leave a message? I’d have imagined that most people calling this Dental Office, if confronted with a machine, would simply hang up and call another office. It was testimony to the writer’s loyalty to her Dentist that she valued and respected her Dentist so much that she would actually do this and leave a message. But I ask you, how much *NEW* business would just keep dialing, and not bother to leave a message? I can’t imagine the number, but it’s FREE money, because those new people calling have already decided from the marketing they’ve seen, that this Dentist is the one they need to help them! And it’s a multi-dentist practice! Thirdly, the messages left by the writer were not returned. Three times the writer left messages asking for her calls to be returned. And three times the Dental Office failed to return the calls. Now most patients would have given up after one message was not returned. But Alexandra chased them down twice. But not a third time. Does the Dentist even know that this sort of procedural failure exists in his office? Is he aware that the messages of valued patients are being ignored, and calls are not being returned? It is said that the number one reason our valued patients leave our Dental Practices and go elsewhere is because of apathy, and perceived apathy, by our staff and by us, their dentist, towards those valued patients. And that feeling of apathy is certainly apparent in this article. The writer felt that, after seeing one of the other dentists in the practice on the television, that the practice was now focusing on the high end of the market, and that her twice yearly check up and cleaning was now “chump change”. Every Dental business needs valued regular patients. A healthy pool of regular patients who trust you and value you will accept treatment more readily, will come more often and will refer more people. Sure the high-end work is nice. And as the writer points out, very profitable. But you need a healthy patient base of regulars. As the writer points out. Otherwise your Dental Office is a house of cards. For more details about my Australian workshops in August 2015, CLICK HERE. I’ve been reminded on calls and in meetings and workshops that I’ve held this week that Dental Practices need to make a profit. You’re not running a charity. You’re not there to be supporting the other team members and leave yourself to last. You’re not there in your community to serve them and only them, at the expense and the betterment of yourself, so that they, the community lead a better life and you do not. The purpose of being in business is being able to sell it for a profit. And also to generate sufficient revenue to allow you the rewards you should gain as a result of all the time, study and financial investments that you have placed upon yourself getting to this point. And this we should never forget. I know that most Dentists make dreadful businessmen. Business in dentistry is brushed over, if it’s even spoken about at all, in Dental School. 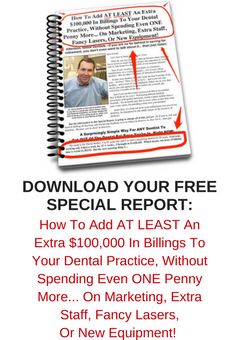 Most dentists I know tend to run their practices, and once per year, at tax time, they see how much money they made, for a time period that has well and truly passed. Rather than accounting their income on a daily, weekly and monthly basis. Most dentists just seem to *hope* that there’s enough money to cover payroll, to cover expenses, and then to live on, somehow. When really it should be the other way around. As assistant dentists, we were paid a commission, or percentage, for our efforts. The remainder amount, which the practice retained, was for practice expenses. But I find it rare indeed to see a Dentist Practice Owner paying himself a commission first, and leaving a remainder in the business. Like I said, most dentist business owners I see pay themselves lastly. So here’s what I’d do as a rough rule of thumb. Firstly, all money collected by the practice for services rendered by hygienists, associate dentists, product sales and by principal dentists should belong to the practice entity. Then the practice should pay the dentists, including the principal dentist, a percentage for each of their individual collections. This payment is for their personal use. For food, shelter, school fees, holidays, leisure. As a rule of thumb this percentage should be “industry norm”. In Australia it is forty percent. Twenty percent for salaries for team members. Twenty percent for practice overheads. Twenty percent for share holder dividends and capital reinvestment for the business. That’s a total of one hundred percent. Firstly, as an owner, the principal dentist should consider there needs to be a return on the funds invested. Whatever the owner has spent purchasing the business, then a market return, just like stock or share purchases, should be paid for the investment. Were that same amount invested in property, then a market rent would be paid. A lot of dentist owners forget this amount they should be collecting. Secondly, as a rule of thumb too, any administrative work performed by the dentist owner, be it payroll, marketing, or HR or just plain bookkeeping should also be remunerated to them *separately* on top of their commission paid for Dental Services. Because, after all, if someone else performed those roles then they would be paid for doing so, wouldn’t they? And associate dentists not performing those duties are paid a similar percentage on their services as principal dentists who *ARE* performing those duties. So make sure you pay yourself first. Make sure you pay yourself for all you should. And make sure you invest your earnings for yourself, into your own investments. Omer Reed told me that ninety five percent of Dentists in the USA reaching age sixty-five cannot afford to retire. I’ll bet it’s because they’ve never remunerated themselves appropriately. Are Your Front Office People Burning Your Money? One of the key points that comes out of my regular one-day workshop is the inability of Dental Front Office staff to deal with simple questions they receive on the phone. The questions, in the main part, are answered by the Dental team as if they are the real question, when in fact, the real question being asked lies just below the surface. When a nice young man asked a nice young lady out to go to the movies, it was not because he wanted to see the movie. Because simply, he could easily have gone and seen the movie on his own. It’s never about the movie. In the same way, the question asked by most callers to the Dental Office is never about the first question. Most Dental Office staff believe this is the actual question. Most Dental Office staff believe this all that the caller is really asking. And sadly, most Dental Office staff answer this question so poorly that statistics will show you that only one in five, or twenty percent of callers to a Dental Office make an appointment when they call. And in this day and age, where with technology and the internet there is the ability now for all callers to have gathered with certainty all the information that they need to make a decision where they want their Dentistry performed *BEFORE* they pick up the phone, it is farcical that this rate of conversion is still so low. In this day and age, the public have the ability to know what you look like, to know what your team look like, to know what your Office looks like, to know everything about you. There’s nothing they don’t really have the ability to find, unless you choose to be so secretive. So when Mrs. Smith starts looking at two Dental practices online, and she sees that at ABC Dental, they have professional photos of a team wearing makeup, and they have detailed pen portraits about those team members and their hobbies and likes, while at XYZ Dental, the photos look like they were taken with a blurry old box brownie and the team look like they’re wearing prison garb and look about as excited as if they were in Cell block A…. Well where do you think Mrs. Smith is going to choose to go? She’s going to call the Office with the better images and information. So if you’re not putting your Office’s best foot forward online and in your marketing, well you’re just turning away potential business hand over fist by being ignorant. And even if you think you don’t need to have a fancy website because your glorious practice relies on word of mouth, well even with word of mouth there will be referred people who will check out your daggy old website and decide to skip the endorsement. “ I have a Dental problem. Can you help me? It’s the same Down Under. When we look at these calls in this totally different way, then we’ll be able to make different decisions in how we answer their questions. With this new understanding, we’ll be able to help these people receive the dentistry they need. Remember, the reason they ask the questions that they do ask is because they do not know how to ask any other questions. They do not know how to say what they really need to be saying. What they really are is a person with a dental need we have not yet persuaded or convinced that our office is the only office for them. Can we help them now? Are You Still Hoping Your Practice Will Get Better? How’s That Plan Working For You? Tuesday morning marked three weeks since I had my right shoulder surgery. The ‘technical” term for the operation is “Joint Resurfacing”, but in reality it is really a joint replacement of sorts. The head of my humerus is gone. My glenoid fossa is still there, with some recontouring. People ask me what did I do to my shoulder joint to wear it out. No more than any other healthy kid did. But I sure as eggs know that hanging a dental mirror out in my right arm for thirty two years, thirty six hours per week surely did not help. So far I’ve had three weeks of rehabilitation and physiotherapy. And this is the interesting part. There are times I wish that I could just snap my fingers and cross my arms and blink my eyes like Barbara Eden used to and my shoulder would be better again. But that’s not going to do it. There are times when I’m lying on the floor on my back slowly sliding a walking stick from left to right for a distance that feels like millimetres, wishing to heck I could just swing the darn thing the way a drum major swings his baton, or mace. And there are the pulleys. It’s no fun sitting on a chair pulling pulleys up and down, knowing that my good shoulder can go up real high, but my “new” shoulder can only be raised so far…. And then, or now, there’s the “walk the fingers” up the wall and down the wall. My physiotherapist says I’m making good progress. But it’s a long long road. I guess the road to rehabilitation for my shoulder is just like the road to rehabilitation for the Dental Practice. Firstly, there was the recognition that something was wrong. My shoulder was not doing what it was meant to do. And it was not performing in the same way as other shoulders. And the difference was both palpable and painful. Sure I could have soldiered on. Sure I could have read books, tried alternate therapies that masked the condition…. But I needed specialist help. The underperforming joint needed replacement. And with that, the new joint, once in place, required training, consistent training, and the right training, to get me back to where I know I can perform. Shoulder resurfacing, or replacement, is not like “The Terminator”. It’s not a simple robotic replacement. You don’t wake up with a totally functioning brand new shoulder, as if the old shoulder was just a bald tyre. Recovery, improvement and rehabilitation take time. I needed to start off with baby steps, under the guidance of a trained professional, the physiotherapist. Reading a book, listening to others, was not going to cut it. And with a new shoulder, you have to crawl before you walk before you run. My shoulder can move well in certain directions but not all directions. But I know, with consistent exercise by me, in the right direction, between visits to the physiotherapist, it will get better and stronger over time. I know that wishing it to get better is not an answer. Hope is never a solution. You can’t hope that your Dental Practice will get better. You can’t wish that the Terminator will visit and simply replace your faulty old parts with functional new parts and all will be honky dory. If I don’t do the physio, my joint will seize up. My shoulder will hitch and I’ll be back to where I started from. And that’s just stupid to even contemplate that pathway. But in the practice of Dentistry, the practice of life, there are educated people who don’t do the small exercises NOW that result in massive massive benefits down the track. If hitting a golf ball was that easy there’d be no golf coaches and teachers. Just golf magazines, books and blogs. And the rest of us would be pros. If we want to hit a golf ball pure, we need the right help. If we want to get our shoulder back to optimal performance, we need the right help. If we want to get our Dental Office back on track we need the right help. You can’t just wish it. And you can’t just hope your practice will get better by reading articles and books alone. You’ve got to put in the yards yourself, too. You need the right advice, regular advice. But you need to do your exercises between lessons. Actions is what makes for changes and results. Otherwise, you’re really only hoping…. For more details about my Australian workshops in July and August , CLICK HERE.